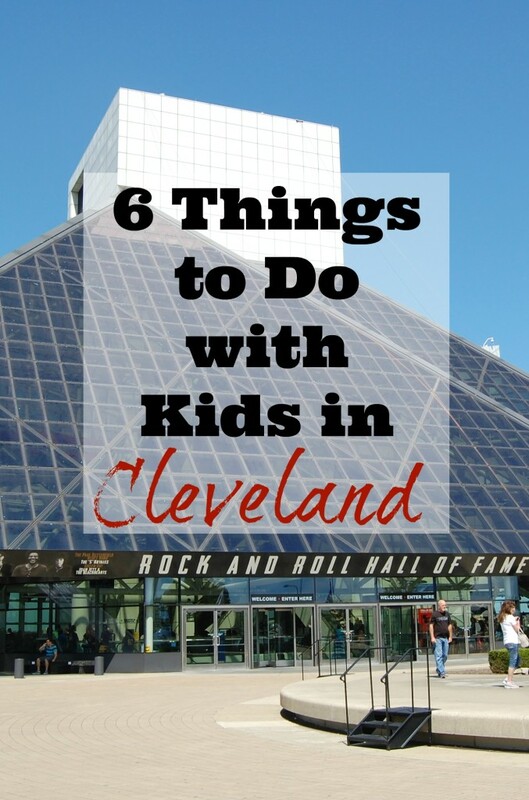 6 Things to do in Cleveland, Ohio with Kids - R We There Yet Mom? This past summer, we discovered fun things to do in Cleveland on our 5 week Austin2Boston road trip. Cleveland is such a cool city, with lots of fun culture, history, & science. It’s totally worth a visit, so plan for a few days to visit the city that ROCKS! To be honest, I have never had a strong desire to visit Cleveland. But on our summer to-do list for the Austin2Boston trip was to spend a day in Sandusky, Ohio at Cedar Point amusement park. And the drive from Niagara Falls to Sandusky took us straight thru Cleveland – the perfect opportunity to get to know this cool city. There really is enough to do in Cleveland to spend an entire week, but with only a day or two, these are the must-sees if you are traveling with kids. I was totally excited to visit the Rock & Roll Hall of Fame, but I didn’t think my kids would be as into as they were. In fact, there was something for each of them. They kept recognizing songs but didn’t know who actually sung them until they saw the exhibit. And they were both astonished to hear that people had tried to ban rock & roll for years. My daughter loved the Elvis exhibit – you can see his custom motorcycle, jukebox, & jumpsuits. My son & I both sat mesmerized at the Beatles exhibit. I am a huge Beatles fan, so it was absolutely worth sitting through the video of the making of all their albums. The Rock & Roll Hall of Fame has a great dining area and awesome gift shops as well. This is perfect for tweens & teens. Located inside The Powerhouse, a 19th-century landmark building, this fairly new aquarium houses more than 5,000 different creatures. The coolest part of the whole aquarium is the SeaTube, a 230,000-gallon tank that houses sharks, sting-rays, eels, and more that guests can walk thru and see them swimming all around. Right next door to the Rock & Roll Hall of Fame, is the Great Lakes Science Center. Filled with lots of hands-on science, technology, engineering, & math exhibits, all 3 of my kids found something fun to do here. When we were visiting, they has messy fun exhibitions on the patio outside – we watched the mentos/coke explosion- have you ever seen that?? Inside, we spent hours on the top floor playing with all the hands on exhibits – making different noises and creating our own types of energy. Also, check out “Cleveland Creates” to make your own vehicles, planes, & parachutes. This is a fun spot to use your brain for a while! Things to do in Cleveland: Take in a Game! Cleveland is home to the Browns (football), the Cavaliers (basketball), and the Indians (baseball), so depending on what time of year you are visiting, take in a game with the family! Did you know that the home from the beloved-Holiday movie, A Christmas Story is located in Cleveland? A fan of the movie bought the home and renovated it to replicate the movie. It’s open for visitors to walk thru and you can see the infamous leg lamp. We didn’t have time to visit, but it would have been fun for sure! Cedar Point isn’t technically in Cleveland, but if you are close enough, you must make the time to visit Cedar Point. Just a short hour drive west, it’s a pretty awesome amusement park, with some of the most innovative rides you will ever go on. It’s set on the shores of Lake Erie and when we visited in July, there was always a breeze, making it a very pleasant day. I have lots to tell you about Cedar Point and will do so in the owing weeks, but just know, it’s worth the trip to go. We re-arranged our entire drive home from Boston to visit and my two older kids now say it’s their favorite theme park they have ever visited. Go figure. There are much more than these 6 things to do in Cleveland – check out a complete list at This is Cleveland.